Percy Kelly was born in Workington, Cumbria in 1918, being one of eight siblings. Despite an early aptitude for drawing, Percy left school at 14 to work for the Post Office. Interrupted by war, he served in the Royal Signals, where his talent for draughtsmanship was utilised in the production of maps. 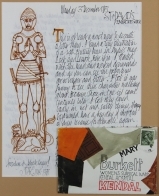 In 1946 Percy returned to Post Office employment, and obsessional painting, working at the Post Office until taking up a full time place at the Carlisle College of Art and Design from 1961 until 1965. 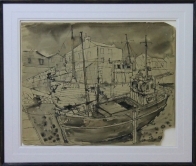 In the early 1950s, Percy submitted works to the Royal Academy, Royal Institute and Royal Society of British Artists; all were accepted, and from 1956 until 1963, Percy was a member of The Lakes Artists Society. 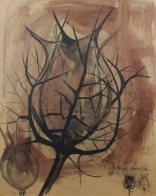 Percy’s first solo exhibition was in 1966 at the Rosehill Theatre, Whitehaven, courtesy of Sir Nicholas Sekers, as too was an exhibition in Sloane Street in 1968. 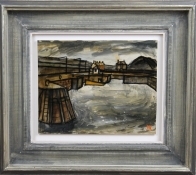 In 1969 a solo exhibition of his work was held at the Fermay Gallery, Kings Lynn, and in 1976, a seventy-painting exhibition was held at Abbot Hall, Kendal. 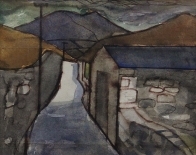 His final solo exhibition was held in Troutbeck, Cumbria, 1984. During his life, Percy rebuffed many approaches to exhibit his work, amongst them from the Crane Kalman Gallery in London, Tib Lane Gallery, Manchester, Goldmark Gallery, Uppingham, and not least from Chris Wadsworth at Castlegate House Gallery. There was much interest in his work during his lifetime, but despite this, only five exhibitions were held; Percy refused to sell all but a very small number of his works. Percy moved to Norfolk in 1980, and died there in poverty in 1993. 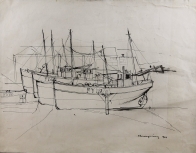 After many successful exhibitions at Castlegate House Gallery, the works of Percy Kelly have been shown in two highly successful solo exhibitions at Messums, London.